Another week of above average temperatures. With the heat and humidity, I just don’t feel like hot food. Unless it’s spicy, that’s is another issue altogether, and I always want spicy. So let’s not turn on the stove. Okay? In the blog world I have been seeing feta/watermelon salads. A lot. So I thought why not jump in? Unlike the rage of kale chips last summer, I just got around to making those. Why oh why did I wait so long? They are fabulous. So don’t wait so long, seize the moment and make this salad. You could pair it with a some precooked shrimp from the market. Or a few cold cuts, for me it would be prosciutto, naturally gluten free. Chill some fruity, crisp white wine. Place arugula on platter and toss with 1/2 the vinaigrette. 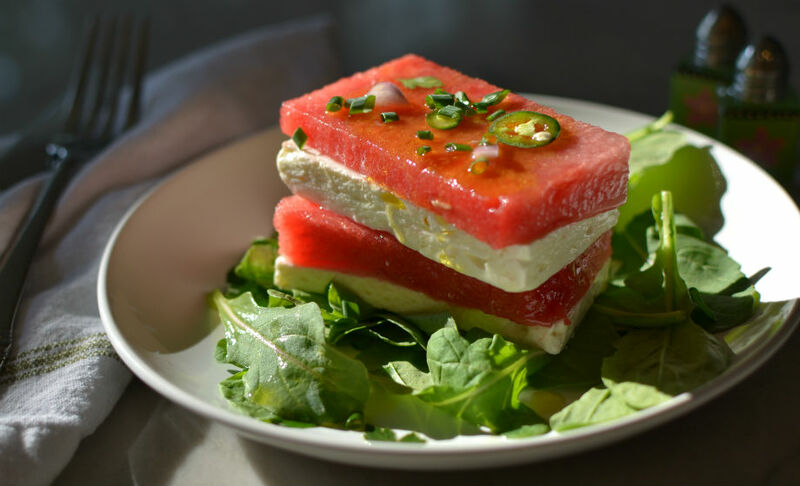 Lay watermelon and feta alternating in layers on top and drizzle with remaining vinaigrette. Or scatter cubed watermelon and feta over arugula and drizzle with remaining vinaigrette. I’m not usually a salad eater but this was wonderful! I made it with spinach and some freshly ground black pepper since we didn’t have any arugula.